Community Action for Rural Development (CARD) has several initiatives in various parts of the country. This programme implemented by CARD in villages around Samathuvapuram, aims to support poor destitute women facing social and economic problems. • The beneficiaries, identified by the village leaders, are given two saris, two in-skirts, one bed sheet, one blanket and one pillow. • These materials are purchased from Pudukkottai by CARD and distributed to the women in their respective villages. Sudha was married to Chandra Sekar of Vedaraniyam about 12 years back. Her husband was working in a advertisement company at Chennai. They lived in Chennai for five years happily. Due to Government regulations, the advertisement business was in crisis and he lost job. He was drinking alcohol and he did not look after the family well. 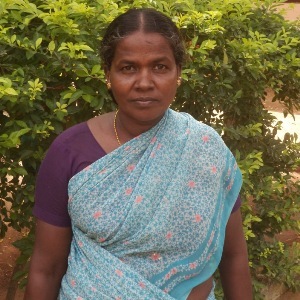 Sudha was not given any money for family expenses. One day, she left her husband with two children and came to Pudukkottai to her sister. After that she came to CARD Home for Women for protection and support. Sudha and her two children were given food and accommodation. Sudha was not having additional dress. She was given two sarees with blouses, two in-skirts, one bed sheet, blanket and a pillow. She stayed in the home for six months. Her husband was called for counseling. Both Sudha and her husband were given counseling by the Counselor. She got back to her husband after six months. Her husband got a new job in Chennai. Sudha is engaged in garland making work and earning Rs.100 per day. Her husband is earning Rs.6000 per month. They are living in a rented house with two children happily.